A Northern Ireland butcher, who previously spent nine years as a chef, combined his skills to give rivals the chop as he was named Butchery WorldSkills UK champion at the weekend. Saulius Repecka, 30, who works for Emerson’s Supermarket, Armagh, collected a gold medal at the WorldSkills UK Live Show at the NEC Birmingham where he impressed judges in the final of the prestigious butchery competition. The Lithuanian, who moved to Northern Ireland 10 years ago, held off a strong challenge from four other butchers who each completed five tasks over two days in front of a live audience. The competition focuses on all the essential skills required for a successful career as a multi-skilled butcher within the food manufacturing industry. Butchers are tested for overall skill, innovation, creativity, presentation, work ethic, method and approach to tasks, carcass and primal utilisation, waste and safe and hygienic working practice. Saulius revealed that the final was only the second time he had competed as a butcher – his debut coming in the Northern Ireland heat of the WorldSkills UK competition this summer. “It is a big achievement and a big experience,” he said. “When I entered the competition, I thought I may be able to get into the top four because I knew there were butchers with more experienced than me competing and it would be tough. “Having spent nine years as a chef before becoming a butcher, I have the chef’s touch, which I think helped. As a butcher, you have to know how to cook, present and describe meat. I became a butcher because I wished to know where the different cuts of meat came from. Silver medallist was Craig Holly, 29, from Neil Powell Butchers, Abergavenny, a former Welsh Pork Butcher of the Year and bronze medallist was Robbie Hughan, 25, from Blair Drummond Smiddy Farm Shop, Stirling. The other finalists were Welsh Butcher of the Year Dan Allen-Raftery, 35, from Randall Parker Foods, Llanidloes and Dylan Gillespie, 23, from Clogher Valley Meats, Clogher. 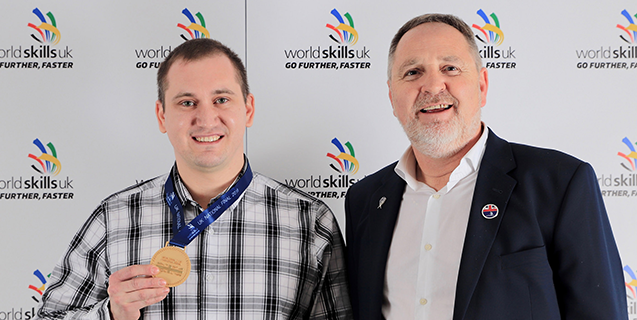 Saulius Repecka receives his gold medal from Arwyn Watkins, OBE, managing director of Cambrian Training Company.